This January 2017 resource from the U.S. Department of Education was developed to enhance state and local efforts to support immigrant children from birth through the elementary grades. The first half provides tips for educators in early learning programs and elementary schools as well as schools, districts, and States to: (1) facilitate school enrollment by immigrant families; (2) promote healthy child development in the school setting; (3) encourage caregiver engagement in their children’s education; and (4) build staff knowledge about immigrant children and their educational needs. The second half provides tips for parents and guardians on how to facilitate children’s learning and education starting at birth. First Things First is accepting proposals for breakout sessions to be presented at the 2017 Early Childhood Summit. Learn more about topic areas, criteria for selection, and how to submit a proposal. To ensure delivery to your inbox, please add ftf@azftf.gov to your address book. You received this email because you signed up to receive communications from First Things First. If you no longer wish to receive this email, unsubscribe here. Please do not reply to this email address. Copyright © 2017 First Things First Early Childhood Summit. All rights reserved. The Well-Visit Planner is a great tool that can increase parent’s engagement in their child’s visit. Families answer a series of questions on their child’s development and can print their results to bring to their next visit.Parents can identify questions, concerns, and priorities prior to the visit which helps improve communication. For more information see the Well-Visit Planner Implementation Toolkit. In Need of Breastfeeding Help and Nutrition Tips? Feeding a newborn baby can be a struggle, but the Arizona WIC Program is here to help! Arizona WIC Program is a free nutrition and breastfeeding program where families can receive personalized nutrition tips, as well as breastfeeding information, support, and resources from nutrition and breastfeeding experts. You can download a PDF of Vroom worksheets for every age. There is even a free Daily Vroom App! 10 Read, read and read some more! 9 Find some time to just play. 7 Try the positive parenting approach. 6 Help your child develop social-emotional skills. 5 Keep expectations for behavior realistic. 4 Support your child’s communication skills. 3 Consider your child’s temperament. 2 Reflect on your experiences as a child. And, the number one parenting tip for 2017 is… just breathe! Being the parent of a young child is an important job, but it isn’t an easy one. 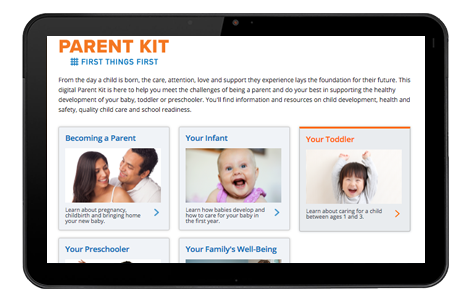 To help parents meet the challenge, the First Things First Parent Kit is now available online at FirstThingsFirst.org/Parent-Kit. 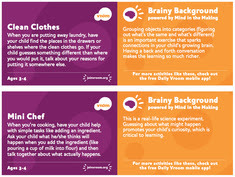 Covering topics including pregnancy, child development, safety, physical and emotional health, setting limits, and quality child care, the Parent Kit provides useful tips and dependable information and resources to help parents do their best in supporting the healthy development of their baby, toddler or preschooler. The Arizona Early Intervention Program is a statewide program for infants and toddlers, birth to three years of age, with disabilities and their families implemented through a partnership between the Arizona Department of Economic Security (ADES), Arizona State Schools for the Deaf and the Blind (ASDB), Arizona Department of Health Services (DHS), Arizona Health Care Cost Containment System (AHCCCS), and the Arizona Department of Education (ADE). The Arizona Department of Economic Security, Arizona Early Intervention Program (ADES/AzEIP), as the Lead Agency for Part C of the Individuals with Disabilities Education Act (IDEA), is seeking public comment on Arizona’s proposed Federal Fiscal Year 2017 Application for Federal Funds ( July 1, 2017-June 30, 2018). This is an opportunity for you to review and provide input and suggestions. The Arizona Department of Economic Security, Arizona Early Intervention Program (ADES/AzEIP) will accept input on the application through April 4, 2017 at 4:00 p.m. The proposed application is available atwww.azdes.gov/AzEIP. If you are unable to access the application electronically, please contact DES/AzEIP at (602) 532-9960 or by e-mail atDCFEFinance@azdes.gov. (1) in writing to DES/AzEIP at 1789 West Jefferson Street, 2nd Floor NE corner, Phoenix, AZ 85007 or DCFEFinance@azdes.gov by 4:00 pm April 4, 2017.